Modern Mexican décor reflects both its historical antecedents and the bold colors associated with Mexico. Look for bright, saturated colors – lots of reds and yellows – against darker vibrant greens. Mexican modernism has its roots in the star-crossed love and marriage of two famous Mexican artists – Diego Rivera and Frida Kahlo. Rivera was already a successful artist and Frida a school girl when they met. He was impressed by her stillness and the way she quietly watched him work. Two years later they were married. Rivera is well-known for his paintings supporting the labor movement, while Frida is better known for her incessant self-portraits. Both used the bright colors associated with Mexican traditional artwork, along with the stylistic drawing styles. Aside from the Riveras’ stormy relationship, Mexican art also draws upon traditional symbols found in ruins left by the Aztecs, Incas and Mayans. Alongside these traditions are the many festivals and events associated with Catholicism as it was imported into Mexico. As it melded with local tradition, it became a somewhat unique tradition. In addition to the ancient tribes, the more modern Mexicans have made their own traditions that incorporate the bright colors and bold designs which are a characteristic of modern Mexican art. The southern part of Mexico includes steamy rainforest areas with attendant bright birds and exotic birds and plants. Perhaps it’s here that the bold colors originate – the vivid flowers, parrots, and even monkeys, against a backdrop of vivid green. Mexico also includes desert areas where sand, cactus and shy birds and bats make use of the limited moisture. Here are ten modern Mexican décors that draw on these traditions, using bright colors, bold designs and a sense of the ineffable. Startling geometrics, vivid colors and unique juxtaposition of items and color characterize these selections. If you’re looking for modern Mexican décor for your home, you will be sure to find a piece or two that will be to your liking. You can use the samples to emphasize other décor features or you could make them the central theme for your decorating efforts in your home or office. 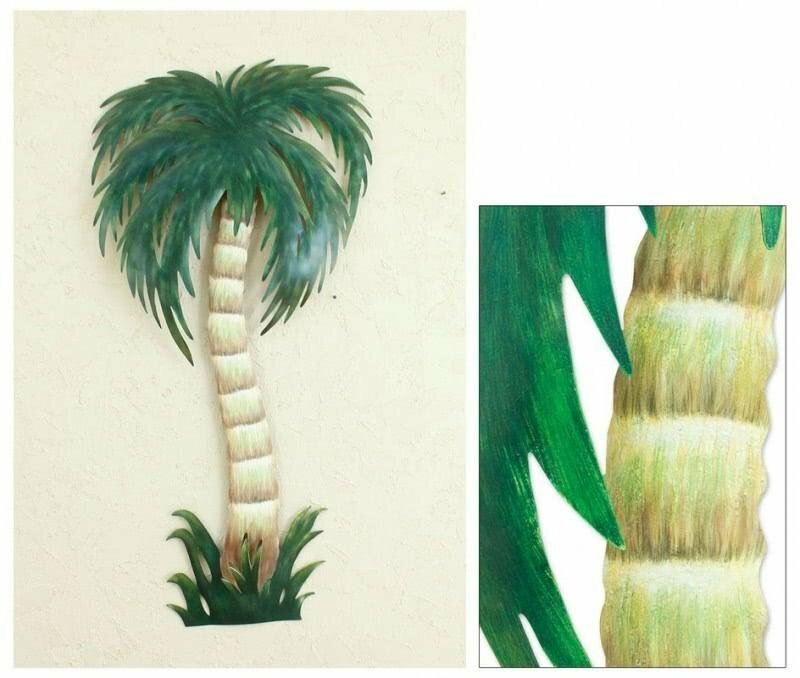 This palm tree stands four feet tall on your wall bringing a Mexican coast feel to your porch and pool. The feeling of the Mexican tropics adds to your garden and presence around your pool keeping a warm feeling even in a cool environment. The trunk of the tree is a light wood tone which will work great. This mermaid has long brown hair with a colorful fin full of purples and blues blended together. The tanned skin tone blends it all together as she looks up at the moon in the sky. An open circle support holding the moon above your wall can add a great deal to this piece, giving it a dark night tone, to a brighter day feel. This incense holder has the moon and stars on it giving it a relaxing nighttime feeling. With its Mexican art designs, it brings different kinds of lore to your modern home. The main body is ivory working well with many white dresser tops or stands out on a darker wood tone lightening it up well for a balance. This clay vase stands tall and narrow not taking much room as a floor vase. The light tone works well in any bright areas with a lot of light. The vase has some reflective spots adding to the lights in the room while adding to the environment. With a contemporary feeling, this piece adds a lot to your modern style home. This large pouf has a lot of summer colors on it and will bring out and enhance all of your earthen toned décor and light décor. The pattern is on all sides increasing the appearance from all directions that it’s looked at. This piece is great to bring out a wide variety of colors in your room as it has many in its bright Mexican art style. This pillow has a lot of light tones and classic Mexican symbolic arts on it. The light tones bring a bright spot on your dark toned furniture. The bright colors can pick up colors used in other artwork in the room, and emphasize them. The art design is on the front and back, making this a double-sided pillow. This print has two flower boats that are being rowed close to each other. One has a woman sitting with a large collection of flowers and a man standing on the other. The light tones work well on a light wall as the frame is a light golden tone bringing eyes to this piece. The colors bring many earth-tone pieces together. With a solid white background, this picture has an upside down pineapple on it. The white back piece lets this piece fit in any light modern style room against a white wall and other light décor. The colors of the pineapple bring out the color of any cacti growing by it and make a perfect backdrop for your garden. Featuring a rustic terracotta build and earthen-tone glaze this torch stands out very well. It gives a rustic charm to your outdoor table and lawn furniture. On the sides, it has flowers of different kinds in bloom bringing color all around it together. Weighing six pounds, it’s heavy enough to sit outdoors and bring light to any occasion. This wall mural has a large yellow and black butterfly on it with its wings spread wide painted in watercolors. The majority of the tones are very light yellows and whites which work well on any dark surface. The outer edges of the wings have dark colors with blues and reds hinted in giving a hidden detail to this piece.